Here’s Day 3 of The Pentecost Novena! Holy Spirit my special intention is for my husband, Frank ! First I ask you to protect him as he travels across the whole United States; to work for the next 10 days! Please give him your strength to sustain him; bring him back home safe to his children and myself; and Holy Spirit —you know he is in need of a different job! Please bring him news of a new job when he gets home! Of course- you may have a better opportunity different than what we ask you; so I humbly ask all this if it’s in your will! Amen and thank you in advance for whatever your going to do ! Thank you Holy Spirit day three Peace. My brother in AZ passed peacefully into your arms this morning. our love carries him to You. Holy Spirit tonight I bring before you my mom Isabella, uncle Telmage,, sister Alvita and nephew Kendrick. I pray for a miracle upon them and whatever is going on in their bodies and mind be broken in the name of Jesus. No weapon formed against them will prosper. Thank you for your breakthrough. Amen. Please pray that my children will reconcile. Praying for my children to go back to church. Praying for my grandson that he will stop wetting at night. Praying that I will be able to retire. Praying for more priests. Come into my family and open hearts to your love. Only then will my Husband see what is hurting me. May he learn to give of himself and realize how blessed our family really is. I pray for my son and nephew as they attend college in a new location. Bless and keep them safe. I pray for all intentions of this Novena. Have Faith everyone for God is with us. Ghat my children will go forward and be stromg and confident. I ask this in the name of jesus. Come Holy Spirit and take charge of our parents lives, take charge of my son’s life. Rebuke and remove all hurdles in the path of getting accepted in medical school. Blessings of all that is needed for him to be accepted in medical school and start school from fall. Thank you Holy spirit for guiding and directing in this path to medical school for my son. Thank you for the healing of bleeding, it stopped , so thank you. Jesus heal his nagging cough. Bless Holy Spirit once for all the seat and admission in med school and stop this confusion and waiting for ever by fulfilling the promise of God for my son to do MD medicine and become medical doctor soon, amen. Oh come Holy Spirit and bring Peace to the hearts of my family and my husband’s family too. May we, with your grace be soon reunited and be the family that God wants ALL the world to be. 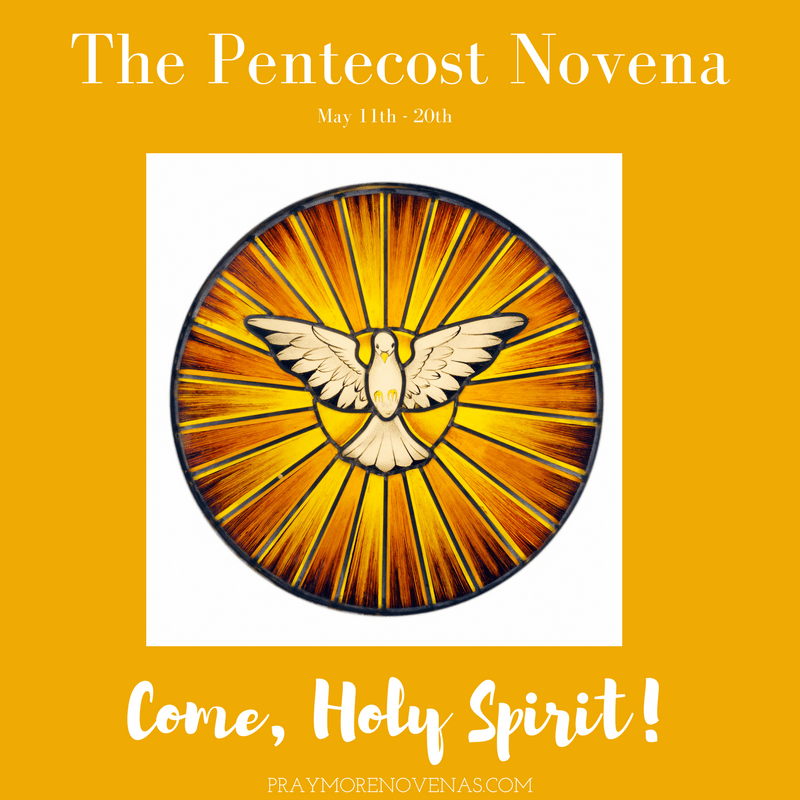 for EVERYONE’S intentions and prayers during this Pentecost Novena to the Holy Spirit. Salaam, Shalom and Peace to All! Holy Spirit, I pray that you shine upon all mothers on this Mother’s Day. I also have special intentions for my brother, who believe that if you pray for him that his troubles become worse. Please send you comforting power to envelop him; and please that he know that the strength he obtains is from the Holy Spirit. For Joe and my faith journey. For my children and grandchildren’s faith—may it grow stronger throughout their lives. For Adam to get on with a Metropolitan Symphony. For Jenna to pass her state licensing and secure a good job using her education. For Sara and Ryan’s move…may it be all they hope for in this move. For all intentions that are offered during this novena! Come holy spirit give us peace in our lives. Peace at work with staff members and our family. Please pray for Cade M. a young man in critical condition suffering from a blood illness. He is an upstanding Christian young man who is steadfast in Jesus. Please, please pray the doctors find out what it is. Thank you for the sale of our house. Come Holy Spirit and bring my nephew, LD and his soon to be wife, CA back into the Catholic. Come Holy Spirit and shine over LD and CA’s final plans for their wedding. Come Holy Spirit and bless LD and CA with a strong, holy, long and happy marriage. Lord I place my financial needs. I pray for my children. I pray that my children would be successful with their studies. I pray for money to finance my son throughout medical school and to meet his other needs.i pray for my marriage and my husband. Lord, I lift up the intention of Jesse, Megan, and their baby. That You may grant them the gift of this child’s life, and a safe birth for both the baby and Megan. I pray that they may raise this child to love, serve, and know you. That this child of theirs and Yours will become a saint. Local Time : 9.35 p.m. I pray for the healing of my father and for my family to have the strength to concur anything and also for my daughter to be with me soon and my papers to come soon. Healing for: Marilyn, Calvin, Pat, Elaine, Mary Ann, Kennon , Tray, Nancy, Deanne, Alex, Janelle, Wayne, Ray, Andrew, Christy, Clayton, Bonnie, Pamela, Sarah, Phil, Kinslee’s great grandmother, Samantha, Janine, Dianne, Isabella, Hadley, Maddox, Kay, Buddy, Kristen, Bevo, Betty, Dane, Mrs Nancy’s husband. Prayers for discernment for my husband and I as we face a significant decision. I’m in so much trouble there’s a whole bouquet of need. Health home family conversion marriage ( in need of 4 husbands ( myself and 3 daughters. Jobs Pets yard car rent. Friends. All is a flower of trouble. Tha k you for what you all do.